Thanks to those who defend and protect our country, we have the freedom to celebrate our country on July 4th. My adopted soldier won’t be home to celebrate this year, so I sent him a patriotic celebration in a box, including Fireworks Sugar Cookies. 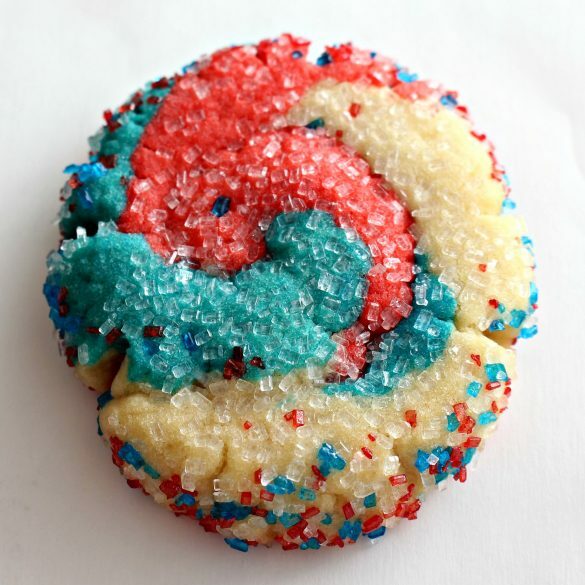 Sparkling with sugar and swirled with red, white, and blue, Fireworks Sugar Cookies burst with sweet sugar cookie flavor! I don’t know where my adopted soldier is deployed. The United States has deployed troops in many places and Soldier P. hasn’t communicated with me. 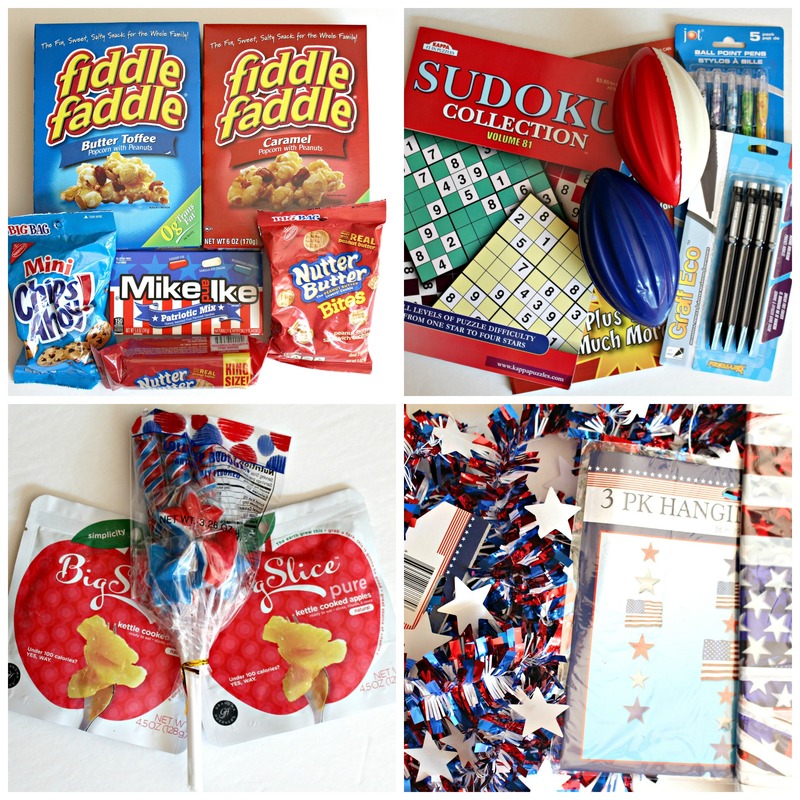 I prepared this July 4th care package assuming that where ever Soldier P. is, it’s HOT. Hot weather care package contents risk melting and spoiling. To minimize the risk, I avoid sending chocolate and gummy candies. I also use desert-safe recipes with ingredients that are less likely to mold or go rancid. Part 1 Care Package Contents: On the Facebook page for Soldiers Angels, the angels often post photos of their most recent care package. So many great ideas! One decorating material that intrigued me was duct tape. Duct tape comes in lots of designs that add color and pizazz to a care package box. The tape can be used to completely cover a box end flap, or can be used just as trim. I used a roll of silver duct tape with patriotic words to attach mylar flag pendants. 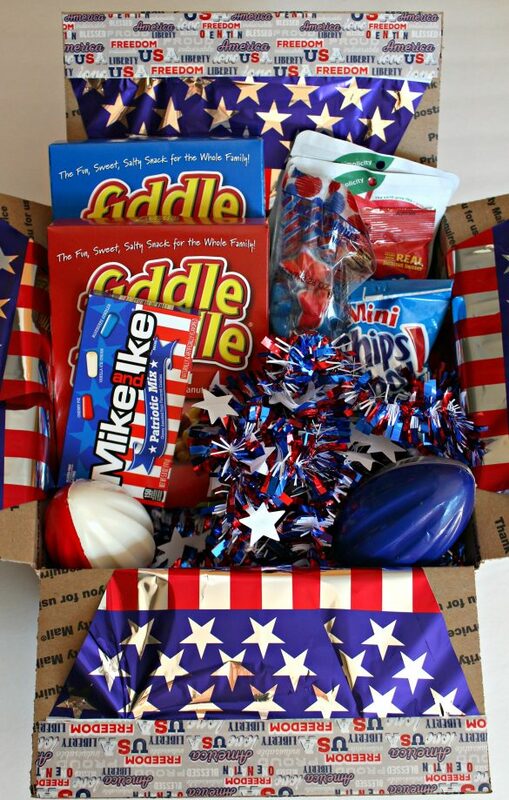 I filled the box with lots of red, white and blue goodies; popcorn ,candy, kettle cooked apple slices, foam footballs, puzzle books, and decorative garlands. Part 2 Circle Sugar Cookies: Fireworks Cookies are an explosion of color and sparkle made with one batch of this desert safe sugar cookie dough. 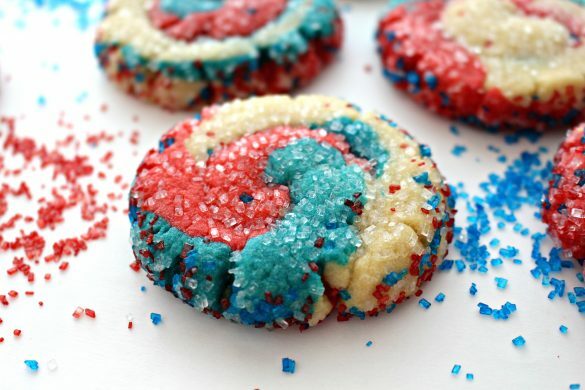 Icing on cookies would melt in the summer heat, so these cookies get their eye-catching shimmer from decorating sugar and their red, white and blue from food coloring gel. Divide the dough into three equal pieces. One is left white, one is colored red with Americolor True Red, and one is colored blue with Americolor Sky Blue. 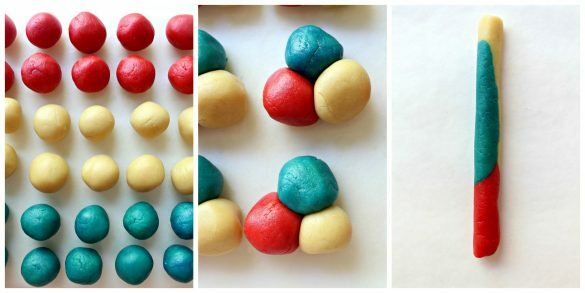 The colored dough is rolled into 48 balls (about 2 teaspoons each). Make groups of 3 balls with one of each color. 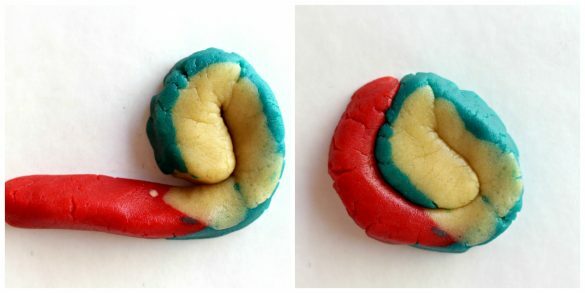 Roll the balls into snakes ( twisting slightly to swirl the colors). The snakes are coiled, then pressed into sugar. 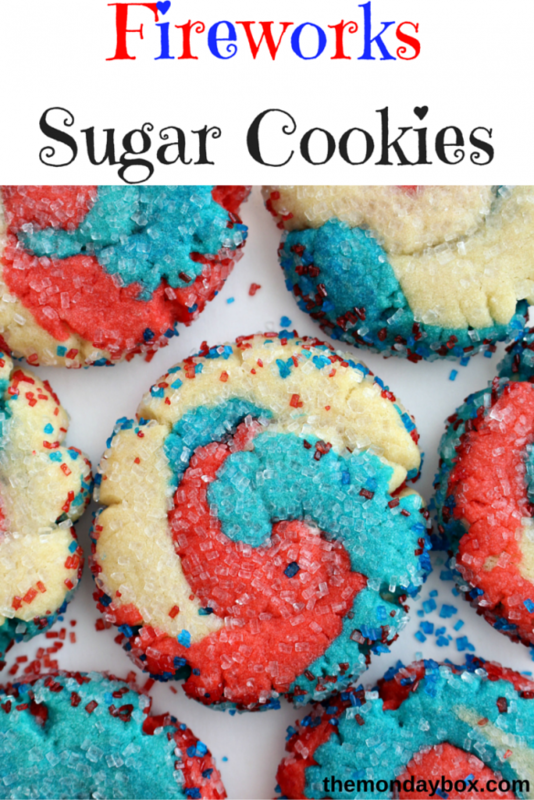 I used a mixture of red, white-clear, and blue sugar for the edges, but used only the white-clear on the top so that the swirled cookie colors would show through. The process is easy and forgiving. The desert safe cookie dough isn’t as pliable as sugar cookie dough that is made with butter and can have the tendency to crack a little as it’s manipulated. Just pinch and press it into shape. A few cracks just give the fireworks character and the decorating sugar covers up the rest! 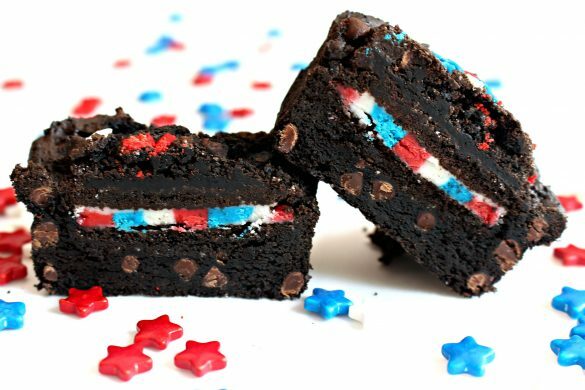 Part 3 New Recipe: Surprise-Inside Brownies are the new recipe added to this patriotic care package. These individual treats have a chocolatey crunch outside and a soft and fudge-like interior. The rich chocolate color and the holiday sprinkles are sure to be attention getters, but the fun part comes after the first bite! An Oreo with red, white, and blue filling is tucked inside! Part 4 Other Recipe Ideas: There are more Monday Box recipe that would be great in a July 4th care package or for a holiday treat at home. For additional red, white, and blue goodies, take a look at these travel worthy treats. Wishing everyone a safe and happy July 4th as we celebrate the USA, with thanks to our military heroes who make it possible! 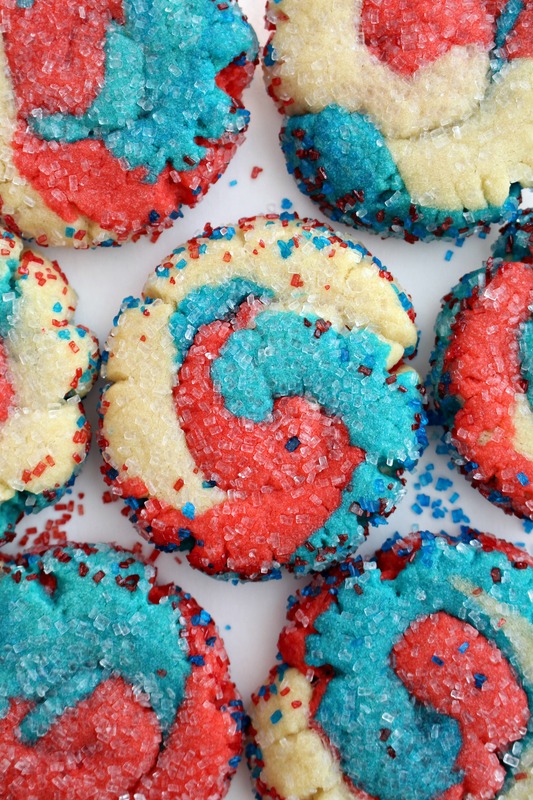 These cookies are so festive and perfect for July 4th and this holiday care package. I love seeing how you actually made it happen. I almost feel like I might be able to do it! Very nice job! My two little cousins are OBSESSED with colored duct tape … I had no idea it even came in any other colors until they were showing me their collection! haha I only remember it in the standard “silver” color! These cookies are so festive and fun for the holiday! I love it! These are very special cookies! Your post is awesome and thanks so much for sharing it with us at Full Plate Thursday. Hope you are having a great day and come back to see us real soon!